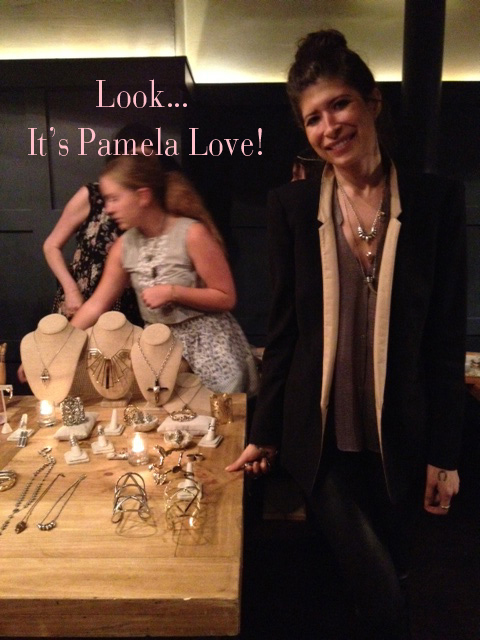 The jewelry designer with her pieces, at Soho House New York. Jewelry designer Pamela Love was born with a creative eye and the gift of laid-back chic. Since beginning her eponymous line of edgy and artistic pieces in 2006, the native New Yorker has catapulted to fame, becoming an international fashion superstar in just a few short years. I met the friendly and hard-working designer at a trunk show at Soho House New York last night. I couldn’t help it—I was star-struck. But less than one week after she was honored with the prestigious Swarovski Award for Accessories at the 2013 CFDA Fashion Awards on June 4th, Love seemed more down to earth than ever. She spent the evening attentively circling the table of her ornate gold and silver collar necklaces and chunky rings, helping a hoard of shoppers try on looks and decide which pieces were best for them. When asked to share her secret to rocking her intricate and multi-faceted jewelry, the tattooed Brooklynite simply and enthusiastically divulged, “Layering!” She herself was wearing three necklaces, five rings, and multiple earrings. Click here to shop Pamela Love’s current collection.